The Holy Qur'an (Summary): Chapter 98 Sūrat al-Bayyinah ( The Clear Evidence ) ~ Islam My Ultimate Decision . Sūrat al-Bayyinah, the 98th Chapter, flanked by the Surahs Al-Alaq (97th Chapter) and Al-Qadr (the 99th Chapter) in the Holy Qur'an is for a reason: Surah Al-Alaq contains the very first revelation of the Holy Qur'an, while Surah Al-Qadr shows as to when the Holy Qur'an was revealed, and Sūrat al-Bayyinah, the middle chapter, explains why it was necessary to send a Messenger gifted with the last of holy scripture, the Holy Qur'an. 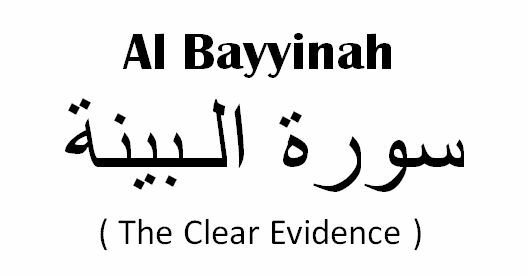 Sūrat al-Bayyinah by its meaning seems to have three parts: the opener which explains who are addressed in the chapter and why, the central idea or the chiasm and the reward for the believers and punishment of those who do not heed to the commandments of Allah. As is very self explanatory, the people to who this chapter is addressed to are the polytheists (of Makkah) and the People of the early Scriptures who have equated the One True God with many man made idols or sharing the other gods with One God, like the concept of Trinity. In fact the People of the Books have turned away from their earlier belief to mis-belief and made changes as per their own wishes. And such are the people both non believers and mis-believers who even when find a messenger among them who has brought the clear evidence of the final word of Allah contained in the last of the holy scriptures, the Holy Qur'an, do not accept the truth and continue to cling to their mis-belief and turn away from the clear proof when presented to them. The comes the central chiasm of the chapter: And they were not commanded except to worship Allah, [being] sincere to Him in religion, inclining to truth, and to establish prayer and to give zakah. And that is the correct religion. In fact all earlier religions have always taught man to worship one true God and give alms, charity or Zakat as in Arabic. This chapter thus tells the polytheists and the people of earlier scriptures that they have in fact either never understood the divine message or have been derailed from the message of truth they earlier had faith in. Indeed, they who disbelieved among the People of the Scripture and the polytheists will be in the fire of Hell, abiding eternally therein. Those are the worst of creatures, for these people rejected the truth in spite of having reason and authority to believe. Indeed, they who have believed and done righteous deeds - those are the best of creatures. And why they are superior to all creatures of Allah, even to the angels? For the angels do not have the power to disobey, and these people adopt Allah’s obedience in spite of having the power to disobey Him. Their reward with Allah will be gardens of perpetual residence beneath which rivers flow, wherein they will abide forever, Allah being pleased with them and they with Him. That is for whoever has feared his Lord. Meaning by the people who did not live in the world fearlessly and independent of God, but feared Him at every step lest they should do something which might entail Allah's wrath and punishment, will have this reward reserved for them with Allah. This chapter is not the only chapter of the Holy Qur'an which warns the polytheists and the mis believers to come back to the right path, the path that has been shown with clear proof, lest the time runs out when there shall be no repentance but burning fire of hell.